The award was received by Julie Rowland, Vice President of the Board of Directors of The Northwest Catholic Counseling Center. 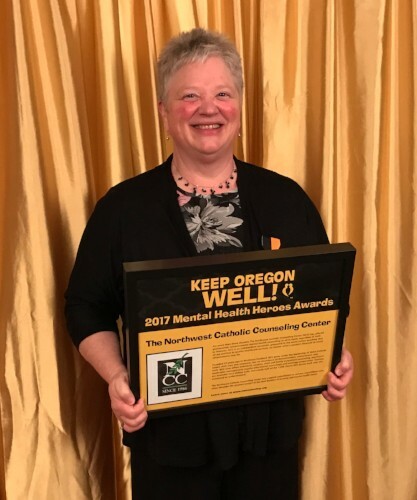 (Originally Posted here) NCC has been chosen as a Mental Health Hero by the Keep Oregon Well campaign! The Center will be recognized at an awards ceremony on May 6 and highlighted during Mental Health Month in May. Huge shout out to counselor Sr. Sarah Deeby, Office Manager Melissa Nelson, and everyone who helps George, and all our clients, feel welcome and get better through their work with us! (Originally Posted Here) Mental Health Awareness Month happens each year in May. In 2015, to mark the occasion, Keep Oregon Well launched an annual 31 day multi-media celebration of the people, nonprofits, community groups and business leaders who have helped pave the way for Mental and Behavioral healthcare to thrive in Oregon and the Pacific NW: The Keep Oregon Well Mental Health Heroes Awards. Mental Health Awareness Month happens each year in May. In 2015, to mark the occasion, Keep Oregon Well launched an annual 31 day multi-media celebration of the people, nonprofits, community groups and business leaders who have helped pave the way for Mental and Behavioral healthcare to thrive in Oregon and the Pacific NW: The Keep Oregon Well Mental Health Heroes Awards. Each year in April we unveil all of the heroes at Trillium’s Black & Gold “Keep Oregon Well” Gala. Many current and previous honorees are in attendance at the event. Then, during Mental Health Awareness Month, we honor one Mental Health Hero for every day in May – 31 in all – announcing a new hero each day on our website, on the radio, and on social media. This process is truly community-driven, with open nominations taking place annually in February.  We call upon the broader community to tell us about who have been the heroes in their lives, in their organizations, and in our state. For this project, “Heroes” is defined as any person or group which has helped to reduce stigma, advance the mental and behavioral healthcare field, and make Oregon and the Pacific NW a safer, more supportive place to live through their service, sacrifice, risk, inspiration, and example. In the end, our goal is to showcase Oregon’s rich history, highlight the diversity of experience it has taken to get us from there to here, and honor those who have bravely paved the way for mental and behavioral healthcare and awareness in our state. From teachers to politicians, therapists to clients, children to seniors, we find heroism everywhere we look. This is our chance to tell their stories and celebrate people who might otherwise be overlooked. A selection committee made up of previous award winners, community members and industry leaders work to narrow down the 31 winners from the hundreds of nominees.